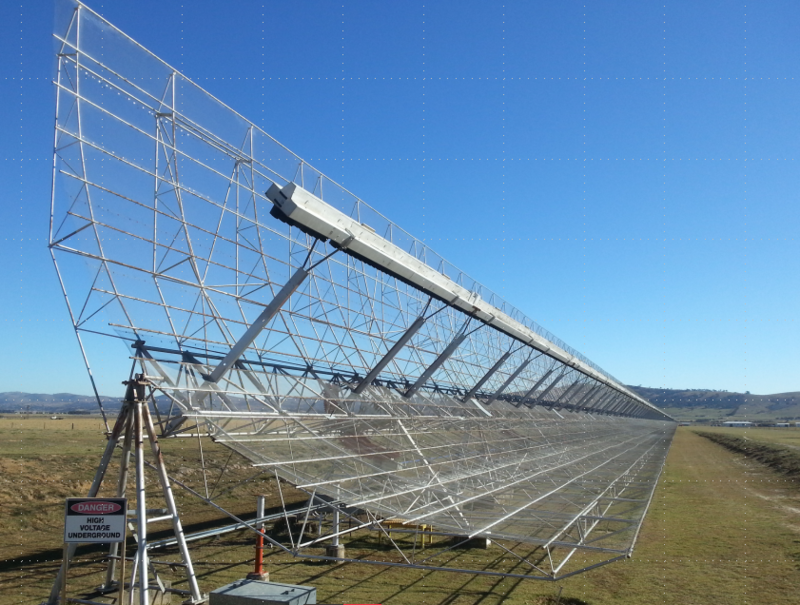 The Molonglo Observatory Synthesis Telescope (MOST) is a parabolic cylindrical antenna consisting of 88 bays that each comprise of 4 identical modules, for a total of 352 independent antennae. It is owned and operated by the University of Sydney’s School of Physics. The modules are arrayed along two arms, aligned East-West, each consisting of a cylindrical paraboloid 11.6 m wide and 778 m long, separated by 15 m gap. Each module is 4.4 m long, and 11.6 m wide. At the focus of the parabola in each module are 22 ring antennae in a line, tuned to a central frequency of 843 MHz, with about 30 MHz bandwidth in the present configuration. View of the MOST at the end of the East arm looking West. Two arms, each 800 meters long, together have a collecting area of circa 18,000 square meters. MOST is the largest radio telescope in the Southern hemisphere. Molonglo tilts its arms North-South. Rotation of the ring antennas (along with additional phase and delay) allows the telescope to point away from the meridian and track a field for up to 12 hours. The Northern pointing limit is declination +18 degrees, and the Southern limit at declination -90 degrees.